PEMF Salmon Arm ~~~ Did you know? Salmon Arm is becoming a central hub within Canada for this wonderful technology of Pulsed ElectroMagnetic Field Therapy. Recently we had a presentation and live demonstration, using 3 of the Omnium1 Mats at The Lavender Lotus in Salmon Arm, BC, Canada. First let me say, I filmed this video near the indoor waterfall in the beautiful Spa location in Salmon Arm. Therefore you may hear running water, and I hope that does not take away from your enjoyment of the knowledge that Adrian shares with us in this presentation. This technology works at the cellular level to energize cells and, most importantly, to get the cells back into the frequency range where they can actually heal. We’ve all evolved on this planet with only certain frequencies. Before Electricity, 100 years ago, there was only 0 to 30 Hz (Hertz). That’s all there was. We are meant to be in tune with those frequencies. Electricity is at 60 Hertz. DEFINITION: The hertz (symbol Hz) is the unit of frequency in the International System of Units (SI) and is defined as one cycle per second. It is named for Heinrich Rudolf Hertz, the first person to provide conclusive proof of the existence of electromagnetic waves. We’re meant to get our energy for our body from the geomagnetic forces of the earth and also from the ionosphere (Schuman Resonance is created by lightning strikes). DEFINITION: The Schumann resonances (SR) are a set of spectrum peaks in the extremely low frequency (ELF) portion of the Earth’s electromagnetic field spectrum. Schumann resonances are global electromagnetic resonances, generated and excited by lightning discharges in the cavity formed by the Earth’s surface and the ionosphere. We are meant to be in tune and resonance with these frequencies all the time, 24 hours a day, 7 days a week. It’s always 0 to 30 Hertz. All the tissues in your body really only heal when they are vibrating in those frequencies. Every tissue in your body has a favourite frequency that it likes to vibrate with. 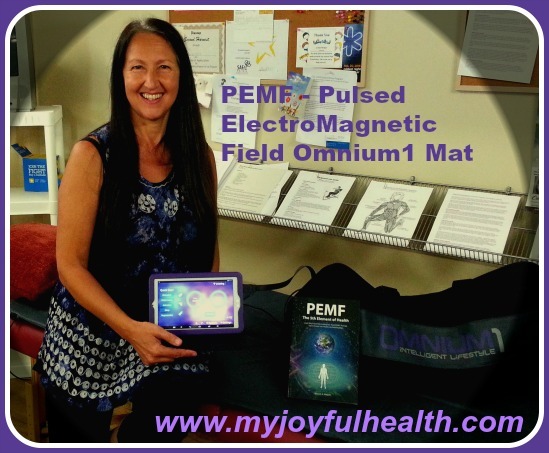 PEMF Salmon Arm, where you can experience the Omnium1 mat for yourself. – As you know, one hundred years ago Electricity moved more indoors. Everybody moved indoors. People became disconnected from nature even more. Most people feel better when they get more nature in their life. Most people’s lives don’t allow for enough time to spend in nature. After Electricity, in the last 20 years, we have moved up from 60 Hertz to Billions of Hertz!! Now we have moved up to – Wireless 3G, 4G, and now they are pushing for 5G. These are Billions of Hertz!! So – there is a principle called Resonance. When you hit a tuning fork, and you have another tuning fork, it starts to resonate with the other one. NOTE: (So crazy, right here in the video, the sound of the end of a session on the PEMF Omnium1 Mat, sounds)…. Things entrain to the predominant vibrations that surround them. Unfortunately, now the predominant vibrations that surround us all are BILLIONS OF HERTZ. Your cells are all basically “Freaking Out”, vibrating at Billions of Hertz. Your body really can’t heal. It keeps you in Stress Mode all the time. Basically your body is in Flight or Fight Mode all the time. Relax and Reverse ElectroSmog with the Ommmmmmmmni Mat.